My name is Derek Johnson and I make websites. I work at The Tomorrow Lab in Belfast where my title is Senior Web Developer, and I blog at No Strong Beliefs. The Senior bit means I get to influence our process. In the two years I’ve been at The Tomorrow Lab we’ve moved from PSDs over the fence to collaborative web and UX design. That’s probably been the biggest change I played a part in and it’s made a huge difference in the quality of work we produce. How did you get started in web development? What is a turning point in your professional career? I used to be a forester in Scotland. I spent all day outdoors (often on high ground) planting and establishing forestry, erecting fences and occasionally felling trees. I loved it but it was a bit of dead end so I decided I needed to learn about computers. I enrolled in a class in a local college where they tried to teach me C++ (I had no idea), MS Office (yawn), Linux server admin (still had no idea), hardware (something about buses) and this amazing thing where you could make web pages, see them straightaway and link them together. I will never forget the feeling when I clicked on the first link I made and it opened another page in the browser. Magical. My first paid web work was a site for a forestry contractor. I was paid ?70. Looking back I think the turning point was when HTML5 Doctor was launched. Reading the articles there made me understand the importance, and dare I say beauty, of semantics for the first time. That led to a much deeper understanding of the web and shaped my thinking on how to make websites. What web development software do you use for your work? My development browser is Chrome and I edit text in Vim. I’ve tried using other editors since I started using Vim but just end up with j’s and :w’s all over the place, so I guess I’m stuck with it! I also use Git, Sass and Grunt in my workflow, and Slack for team communication. Standard Apple fare. At work it’s a 27-inch iMac with an Apple wireless keyboard and a magic mouse. There’s a second monitor made by Dell, that’s all I know about it. My personal computer is a mid 2012 13-inch MacBook Air and it’s still going strong. To be honest I know more about synchronised swimming that I do about computers! The hardware has to be a good tool but beyond that I don’t get excited by what’s inside it. I’m not fussy. Once I’m sitting down and concentrating my environment doesn’t really come into it, and that’s especially true if I’m wearing headphones. I love being in the world I create when it’s just me and the code. The only thing I don’t have now that I would like to try is a standing desk. What are your favorite books and resources about web development? Some of the A Book Apart series have been really helpful too. HTML5 for Web Designers, Mobile First, Responsive Web Design and Responsible Responsive Design are probably my favourites. MDN is invaluable and comes with a huge amount of authority. That makes a big difference because I can be confident that what I read there is correct and I won’t have to verify it elsewhere. Can I use is excellent too, and is my most commonly used custom search in Alfred. I would have to say the HTML5 spec is also a favourite resource. A deep dive into semantics is good for the soul from time to time, you know! Who are the web developers and creatives you admire most? That’s a long list! Let’s start with anyone who’s ever answered a question of Stack Overflow. Then there’s Sara Soueidan whose work is world class. She’s best known for SVG wizardry but even when she’s writing about other stuff like CSS will-change she has a deep knowledge and understanding of the material that’s hard to find anywhere else. I’m in awe of Lea Verou too. Her writing, speaking and tools are all top drawer. People like Tiffany Rayside who produce amazing art and demos with web standards are also people I hugely admire. I’m focusing a lot on performance lately so anything Jake Archibald, Lara Hogan and Scott Jehl produce will have my attention. Overall the people who have had the greatest influence on the way I think about and carry out my work are Jeremy Keith, Rich Clark, Paul Boag and Toby Osbourn. Jeremy Keith’s deep understanding of the nature of the web and relentless focus on designing for that with progressive enhancement have struck a chord with me. 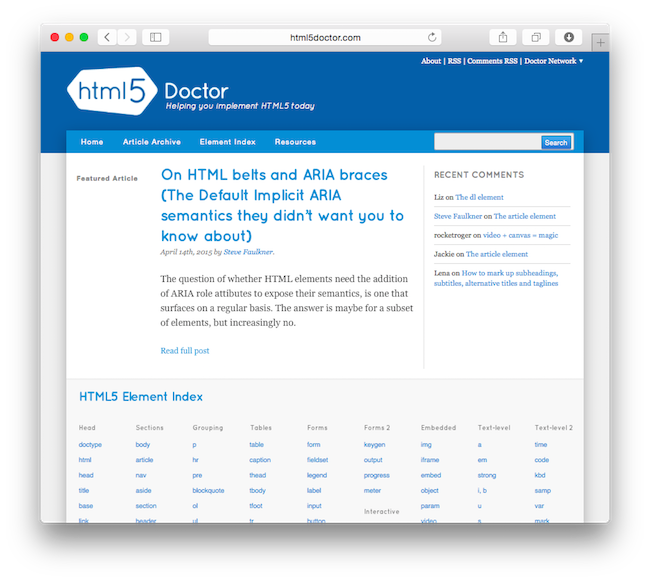 I’ve already mentioned HTML5 Doctor, a project led by Rich Clark. He pretty much mentored me in HTML5 as a moderator on HTML5 Gallery. I learnt a lot from Rich and owe him pints. My work is client websites, so listening to Paul Boag has meant better process, better relationships and better websites for our clients. Toby is a friend as well as an influence, and the single-most talented all round developer I have ever met. His I love programming post is a nice insight into what makes him tick. If you ever meet him ask him what he’s working on, it’ll be pretty cool stuff. However, to answer the question directly, the developers I admire the most are those who have jumped out of the trenches to advocate for women, minorities and under-represented groups in tech. There are too many to mention individually but they are the bravest and most selfless people you will find in our industry.